Did you think those $5,000 Gold PS3s were expensive? 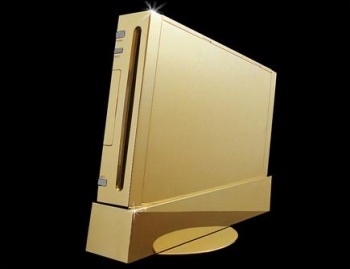 Think again: For the price of one of these gold-plated Nintendo Wiis, you could buy almost a hundred of its golden PS3 cousins. Last week, we brought you all news about special customized PS3 Slims that had been coated in gold, and which were priced at $4,999 - surely an exorbitant price, we laughed. Who would ever pay $5,000 for a shiny-looking console? Now, it seems like we've, er, got some perspective on the matter. Liverpudlian (that's "From Liverpool" to us Yanks) Stuart Hughes is selling customized Nintendo Wiis which he calls Wii SUPREMEs, and like the PS3 Slims, they're golden... only he's asking a bit more for them. Specifically, his asking price is a not-insignificant Â£299,995, or $483,981.93 - so for the price of one of these babies, you could get golden PS3s for you and 95 of your friends. To be fair to Mr. Hughes, though, I'm sure that "2,500 grams of solid 22ct gold" and "78 x 0.25 ct Flawless diamonds which total 19.5 ct" cost a hell of a lot of money, but $500,000 seems a bit steep even when considering the six months' time that apparently went into the creation of these machines. Only three of the golden Wiis will ever be made, but I wonder if anyone will ever buy a single one - or will they have to wait until Hughes throws in a gold-plated Wiimote to seal the deal?